Have you thought of training to become an Alexander Teacher? Do you wonder what type of person decides to train to be an Alexander Technique Teacher and what the criteria are for joining one of the STAT regulated courses? Every teacher has to start their experience of the Technique through being a pupil, learning about their own use and mis-use, perhaps in short Introductory Courses but definitely in 1:1 lessons. It is a learning experience, not a form of treatment, right from the start and it is up to each of us to decide just how far we wish to take the learning. Pupils that are new to the Alexander Technique, often start lessons because they either have a problem such as back pain or they want to learn to use their bodies more efficiently so that they prevent problems from developing. Unfortunately, some pupils just want a quick fix, learn the Technique at a very superficial level and rush away from lessons as soon as they think their problem is sorted - their problems probably return again, later. Some people look after their car better than the way they look after themselves! They polish the car constantly and service it regularly - but they expect their own body to continue working well for them even though they give it very little care and attention. At the other end of the spectrum, many pupils take the AT work on board at a deep level and make it a part of their life, so that it influences their whole way of being in the world. These pupils tend to continue having lessons on and off throughout their life, because they find the Technique so valuable for their wellbeing. One such pupil, who first came to me when she was going through a very stressful period in her life, found that having AT lessons helped her to become calmer so that she could more easliy cope with things and she said that she wants 'to train to be an Alexander teacher, so that I can make deep changes in my life, which would help both me and my son'. It is rewarding work and many teachers run their teaching practise alongside thir other profession, which can give a good and varied work pattern. There are teachers who are also office workers, doctors, professional musicians and athletes. Some of these AT teachers will develop a particular focus to their A/T teaching which relates to their other profession. For many years I taught the Alexander Technique whilst also working in psychology and stress management. Sometimes this develops into a blending of techniques to form an off-shoot to the Alexander Technique, such as the linking of AT work with swimming, as in the Shaw Method. It perhaps also needs to be said that having two jobs has a practical side to it, as few people become rich from just their Alexander teaching! Many teachers work in a variety of venues, which adds interest to the work. 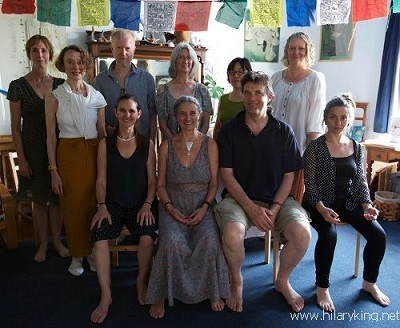 Over the years I have taught in an Alexander Centre, community colleges, a hospital, offices, my own home, a music college, music summer schools and alongside a yoga course in Crete. Other teachers could add other venues to the list. Many teachers continue teaching well past their 'retirement' age, because they just don't want to stop doing something they find so satisfying and, significantly, because they are fit enough to be able to do so. I remember Margaret Goldie (1905-1997), one of Alexander's first pupils and first-generation teachers, when she had her 90th birthday whilst still teaching in Bloomsbury. She told me 'I hope I am still of some use' - and indeed she was, she was still a sought after and highly respected senior teacher . F M Alexander himself was still teaching and running his teacher training course up until his death at the age of 86. This first ever A/T training course was started by Alexander in 1931, in London. These days, most UK teachers are members of the Society of Teachers of the Alexander Technique, STAT, which was formed in 1958 by teachers who had trained with F M Alexander himself. It is perhaps the most respected Alexander Teachers' organisation in the world. All UK Alexander teachers that are registered with STAT, will have undergone a three year Teacher Training at one of the STAT Approved Training Courses. There are 19 such courses at present in the UK, seven of which are in London. All these courses, plus five overseas training courses, are regulated by STAT through external moderators. Each course has its own characteristics and 'flavour' so if you are contemplating doing the training, it can be a good idea to visit more than one, to see which you prefer. Over time there has been an inevitable formation of styles of teaching the Technique and in the UK there are three main strands which have developed out of the training schools that were run by first-generation teachers Patrick Macdonald, Walter Carrington and Wilfred Barlow. There are also numerous teacher training courses worldwide, which are regulated by Societies which are affiliated to STAT. This has lead to there being over 2,500 registered Alexander teachers working around the globe. However, there are still large areas of the word waiting for AT teachers to arrive there, so more teachers are needed. The criteria for joining a teacher training varies slightly from course to course but there is a general consensus about the main requirements that students need to meet. All the STAT Approved Training Courses require prospective students to have had a good number of individual Alexander Technique lessons, usually at least 20-30 lessons, before starting a training course. Importantly, students need to demonstrate that they have had a good groundwork in the Technique, have gained an improved level of use and a good understanding of and interest in, the basic principles of the Technique. The training courses run for four hours a day, four to five days a week, for three years. These hours allow students to continue with some paid work whilst training. Trainee teachers will continuously work on their own use during the course, gradually learning how to work on other people and fine tuning the way they use their hands. Although the courses are predominantly practical, students will also learn some anatomy, plus read, discuss and sometimes write about F M Alexander's books and those of senior teachers who have written about the Technique. The training courses are generally small and the teacher-student ratio is 1:5 so there is a high level of individual attention given to students. There is often an intake of new students each term, which creates mixed-ability groups that allow students to learn from each other about their use - and their mis-use! Teachers come from all walks of life, so there can be a rich mix of lifestyles and skills to which the Technique may be applied - all valuable experience which will help when new teachers begin to work. Although the learning of the Technique is fundamentally the same for each pupil, everyone brings their own mix of habits, life experience and the demands of their daily life and work. So students become able to work with the needs and habits of such varied pupil-types as pregnant mothers, musicians, office workers and builders, for instance. Many training courses welcome experienced AT pupils as visitors, where they are often able to act as 'bodies' for the students to work on. This allows the visitor to see what the schools are like, whilst receiving some extra AT teaching, usually at very low cost. This process also allows trainees the experience of working on a wider range of people who have already had some Alexander lessons and are able to work on themselves to some extent but who tend to be less experienced than the students on the course. This can help prepare students for the time when they begin to teach pupils who are new to the Technique. In the final stage of the training, students begin to teach 'real' pupils, under supervision. These pupils generally only pay a nominal sum to the trainees, so it also offers people on a low income the chance to have lessons, a lovely win-win situation. Sometimes these trainees will also be able to extend their learning by assisting teachers who run introductory group workshops and courses - another situation where everyone benefits.